← Souvla’s Cypriot Grain Salad!!! Boxed chicken and vegetable broths are always more convenient to use, and a lot less bother than cooking up a brothy storm in your kitchen, but they contain those sneaky extra ingredients, and quite a bit of salt. This can be avoided if you make your own at home. I’m pretty lazy and only really get around to doing this if I’m doing a detox (usually the Wild Rose Herbal Detox), or if I have some extra time on my hands and am bored. 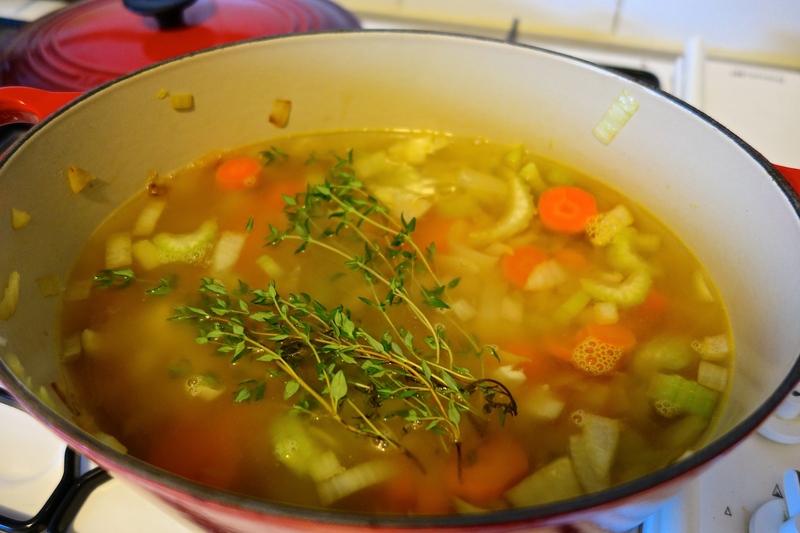 I also find chopping quite therapeutic sometimes, and if you are in the mood to make both of these broths at the same time, there is quite a bit of therapy involved! To save time, you can double or triple these recipe and freeze the broth in 1 cup bags for later use. Vegetable broths is handy when you’re cooking a soup, such as cauliflower and nutmeg soup, or a spiced carrot soup, and the chicken broth adds a nice flavour to cous cous, puy lentils or bulgur wheat. You can also use it in baked dishes like chicken vesuvio, or as a substitute for wine in baked fish recipes, like salmon en papillote. Veggie broth, ready to boil! ♥ Roughly chop the onions, celery and carrots into a smallish dice. Smaller pieces will allow more of the flavour to infuse into the broth. If you are having broccoli or another vegetable for dinner on this particular evening, reserve any stalks to put in this broth also. ♥ Heat the olive oil in a large stock pot and add the vegetables, cook them over medium heat until soft (about 5 minutes) and then cover and let sweat over very low heat for 10 minutes. ♥ Add the crushed garlic, herbs and peppercorns, and season with salt. Add the cold water and once it has reached boiling, reduce to low heat and let simmer (not boil!) for about 1 – 1 1/2 hours, or until the broth is very flavourful. ♥ Drain into a large bowl for immediate use, or refrigerate for later. To save time, double or triple this recipe and freeze the broth in 1 cup bags for later use. There’s nothing that I dislike more than a watery chicken stock, so I add less water than some recipes call for. ♥ Roughly chop the onions, celery, and carrots into a small-ish dice, smaller pieces will allow more of the flavour to infuse into the broth. If you are having broccoli or another vegetable for dinner on this particular evening, reserve any stalks to put in this broth also. ♥ Add the chicken pieces, crushed garlic, herbs and peppercorns, and season with salt. Add the cold water and once it has reached boiling, reduce to low heat and let simmer (not boil!) for about 1 – 1 1/2 hours, or until the broth is very flavourful. ♥ Drain into a large bowl for immediate use, or refrigerate for later.